This week, my son turned seven. Choosing a present for a boy his age can be tricky: how does one compete with an iPad for his undivided attention? What kind of gifts would be good for both our children and our planet? Here are some ideas. 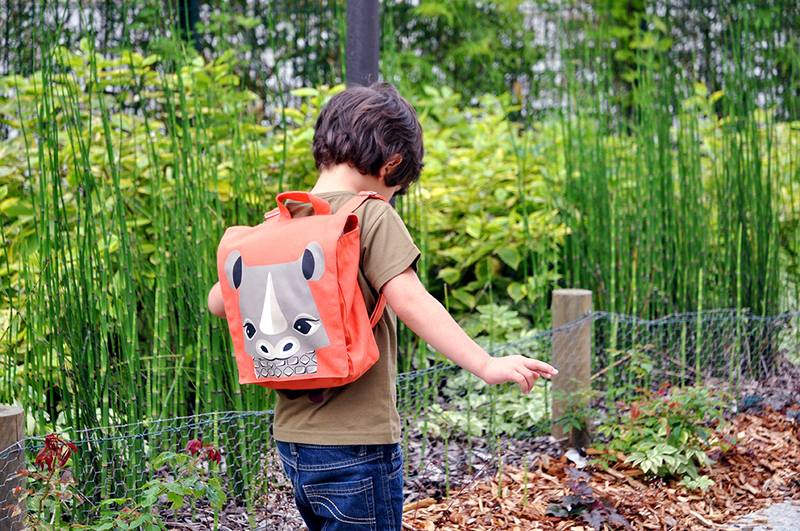 Rhino backpack from COQENPATE’s Save Our Species collection. Photo via sospecies.org and coqenpate.com. While my son really doesn’t think that clothes make good presents, he very much loves animals. That’s why he was delighted with his Tiger T-shirt produced by French company COQENPATE. Since its creation in 2007, COQENPATE has been producing children’s clothes and accessories from 100% organic cotton, vegetable-dyed and recycled materials. They have recently partnered with SOS – Save Our Species, an initiative led by the International Union for Conservation of Nature (IUCN), by donating a part of the company’s profits. The Save Our Species range includes apparel, school bags and pencil cases, featuring eye-catching designs of tigers, lions, sharks and other much-loved creatures that are also species protected by SOS-funded projects. Another great company that makes sustainable clothes for active kids is Denmark’s Katvig. With its slogan ‘We take care of the earth for future veterinarians, firemen and ballerinas’, Katvig walks the talk by using organic, recycled and biodegradable materials and avoiding toxic chemicals. The company also organizes clothes-swapping parties for parents to reduce the amount of kids’ clothes going to landfill. Stockholm-based Tellkiddo offers creative paper and fabric storage bags. Photo via tellkiddo.com. Do you know what a seven-year-old’s bedroom looks like? You’ve guessed it: it is messy! On any given day it can be transformed into a space station, a museum or a racetrack. Swedish brand Tellkiddo has a creative answer to the problem: recycled paper or fabric bags that are perfect for storing books, toys and laundry. Tellkiddo was started by a young mom living in Stockholm with her family full of boys – so she obviously knows the ‘time to tidy up’ drill! Kids are only spending a few minutes a day outside, compared to several hours with their gadgets, says National Wildlife Federation. Photo via NWF. However, the biggest challenge many parents are facing these days is how to get kids to play more outside and experience nature. Through its Be Out There campaign, the US National Wildlife Federation (NWF) is reconnecting kids with nature. According to NWF, the amount of time kids spend outside is alarmingly low–only minutes per day–while screen time is at an all time high (upwards of seven hours). Check out these great tips to get your kids away from the screens and into the sunshine by NWF and Good Housekeeping – from camping in the backyard to learning how to be a nature detective. And get out there is exactly what I am going to do with my Birthday Boy right now! Really useful information! Knowing that you buy clothes that are made with organic and recycled materials is so nice! I’ve never heard about those swap parties, but I like the idea a lot! Thanks for sharing here, I’ll definitely spread the word!